The Matterhorn is falling to bits due to climate change. WITH its four steep faces reflecting the compass points, the mighty Matterhorn has proven an irresistible and often deadly challenge to mountaineers. But now, the mountain - one of Europe's tallest and most celebrated peaks - is falling to bits due to climate change, according to a new scientific report. As with other Alpine mountains, experts have already documented the retreat of the peak's glaciers and the thinning of its permafrost in the wake of rising temperatures. But scientists now say they have evidence that these rising temperatures are also prompting the physical disintegration of the mountain itself. Researchers from the University of Zurich, who have been studying the mountain closely since 2007, say melting water is permeating exposed cracks and crevices on the 4,478m (14,690ft) mountain, which straddles the Swiss-Italian boarder. Subsequent cycles of freezing and thawing in these gaps are creating subtle movements under the rock surface, causing ever-widening fissures with the result that lumps of rock are falling off, the researchers say. Their investigation, which relies on sophisticated monitoring devices situated on 17 key parts of the mountain, was prompted by a huge rock fall from the Hörnligrat part of the mountain in July 2003, when more than 50 climbers had to be airlifted off the mountain in the one of the big- gest rescue operations ever mounted in the Alps. 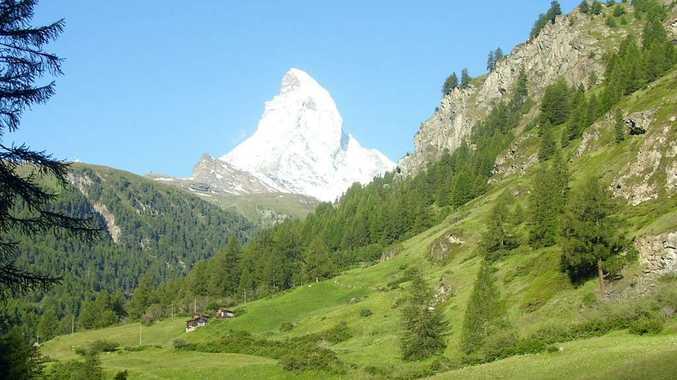 The disintegration of the Matterhorn, which the researchers warn is symbolic of the problems affecting the rest of the Alps, appears to have continued since, the Swiss research team's report in the Journal of Geophysical Research. "There has been a big increase in the number of rock falls in the past decade that can't be explained simply by the fact that we're looking out for them more now," the lead researcher, Stephan Gruber, told The Independent. His team's discovery of the key role that icy crevices play in the Matterhorn's decay suggests that global warming's deleterious effect on mountain ranges is greater than previously thought. "We have shown the importance of icy crevices and the melting water entering them, in the process of rock falls," Mr Gruber said. "Unlike rock itself - changes to which take place over a very long period of time - just a few decades of temperatures rising by a degree or so are enough to affect the ice and water on the mountains." "It's reasonable to expect the same processes are widespread elsewhere in the Alps at the same altitude," he added. Dr Gruber noted that his discovery might have important safety implications. "In high altitudes, key cable-car structure in areas with icy clefts might need to be checked carefully," he said.